Om Mani Pädme Hum is the compassionate wisdom of all the Buddhas manifested as sound. Within it is contained the essential meaning of all eighty-four thousand sections of the Buddha's teachings. the Buddha...taught the Four Noble Truths... that suffering has a cause... the five principal obscurations... desire, aggression, ignorance, pride, and jealousy... that there is a path that leads beings away from suffering... that suffering can thus be brought to cessation. As you progress... spiritual qualities will naturally arise, and you will see the truth of the teachings. Those qualities will bloom spontaneously because the buddha nature within you is being revealed. If you persevere in the practice of these instructions, you can be sure of achieving results. Dilgo Khyentse Rinpoche (Tibetan: དིལ་མགོ་མཁྱེན་བརྩེ་) (c. 1910 – 28 September 1991) was a Vajrayana master, scholar, poet, teacher, and head of the Nyingma school of Tibetan Buddhism from 1987 to 1991. He taught many eminent teachers, including the Dalai Lama. After the Chinese invaded Tibet, his personal effort in the preservation of Tibetan Buddhism was crucial. Once you have the view, although the delusory perceptions of samsara may arise in your mind, you will be like the sky; when a rainbow appears in front of it, it’s not particularly flattered, and when the clouds appear, it’s not particularly disappointed either. There is a deep sense of contentment. You chuckle from inside as you see the facade of samsara and nirvana; the View will keep you constantly amused, with a little inner smile bubbling away all the time. If your mind is constantly preoccupied by your money and possessions, you are in reality only preparing the ground for rebirth as a spirit tortured by hunger and thirst. If your thoughts are obsessed with your family and loved ones, you are only strengthening the pangs of separation you will suffer when you die. But to have devotion constantly in your mind will endow you with lasting serenity and satisfaction. Remembering even the name of your spiritual teacher is enough to completely transform your perceptions. Visualizing the guru above the crown of your head, even for an instant, can dissipate the veils of illusion. Devotion is the ring that allows the hook of the teacher’s compassion to pull you out of the mire of samsara. When death finally comes you will welcome it like an old friend, aware of how dreamlike and impermanent the whole phenomenal world really is. Never forget how swiftly this life will be over, like a flash of summer lightning or the wave of a hand. Now that you have the opportunity to practice dharma, do not waste a single moment on anything else. The mantra Om Mani Pädme Hum is easy to say yet quite powerful, because it contains the essence of the entire teaching. 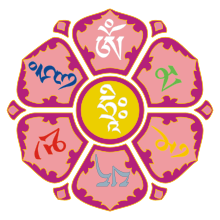 When you say the first syllable Om it is blessed to help you achieve perfection in the practice of generosity, Ma helps perfect the practice of pure ethics, and Ni helps achieve perfection in the practice of tolerance and patience. Pä, the fourth syllable, helps to achieve perfection of perseverance, Me helps achieve perfection in the practice of concentration, and the final sixth syllable Hum helps achieve perfection in the practice of wisdom. So in this way recitation of the mantra helps achieve perfection in the six practices from generosity to wisdom. The path of these six perfections is the path walked by all the Buddhas of the three times. What could then be more meaningful than to say the mantra and accomplish the six perfections?" You have not obtained this precious human existence just by chance. It is the result of having heard the buddha's name in a past life, having taken refuge in him, accumulated virtuous actions, and of having developed some wisdom. There is no certainty that you will obtain this vessel again. If you fail to practice the Dharma in this life, it is certain that you will not obtain a human existence in the next life. To neglect such an opportunity would therefore be very foolish. Do not waste it. Practice day and night. Every day, remind yourself that if you do not study and reflect upon the teachings, meditate, and recite prayers and mantras, at the moment of death you will be helpless. Death is certain. If you wait for the moment of death to begin your practice, it will be too late. Think about why you are engaging in practice. Wishing to obtain a long life free from illness, or hoping to increase your wealth and influence are petty aims. Practice to free yourself and all others from the suffering that is samsara. When buddhas look at samsara with the eyes of their omniscience, they do not see it as an enjoyable place. They are acutely aware of the sufferings of beings... and they see how senseless are the pointless, temporary goals that beings try so hard to attain. It is important to become more and more clearly convinced that the only thing worth achieving is supreme enlightenment. Contemplate death and the sufferings of samsara, and you will not want to waste a single moment in pointless distractions and activities, such as trying to get rich, defeating your enemies, or spending your life protecting and furthering the interests of those to whom you are attached. You will only want to practice the Dharma. A bedridden patient only thinks about getting well again. He or she has no wish to remain sick forever. Likewise, a practitioner who yearns to leave the miseries of samsara behind will make use of all the ways in which that can be done, such as taking refuge, generating the mind set on attaining enlightenment for the sake of others, undertaking positive actions, and so on, with a firm determination to get out of samsara constantly in mind. It is not enough to wish from time to time that you could be free of samsara. That idea must pervade your stream of thinking day and night. When the Buddha first turned the Wheel of Dharma, he taught the Four Noble Truths. The First Noble Truth is that there is suffering, and it should be recognised. The Second Noble Truth is that suffering has a cause, which therefore needs to be given up. That cause is the kleshas, the negative emotions or afflicting mental factors. Although there are many such obscured states of mind, the five principal obscurations are desire, aggression, ignorance, pride, and jealousy. The Third Noble Truth is that there is a path that leads beings away from suffering; this path therefore needs to be followed. The Fourth Noble Truth is that suffering can thus be brought to cessation. Through the Four Noble Truths, the Buddha urged us to renounce worldly concerns and strive for liberation from samsara. As you progress through these three steps, spiritual qualities will naturally arise, and you will see the truth of the teachings. Those qualities will bloom spontaneously because the buddha nature within you is being revealed. The buddha nature, or tathagatagarbha, is present in all beings, but is hidden by obscurations, in the same way that buried gold is hidden by the earth under which it lies. As you listen to, reflect, and meditate on the Dharma, all the inherent qualities of your buddha nature will be actualized. When a field has been carefully prepared and planted with seeds, and all favorable conditions are present, such as temperature, moisture, and warmth, the seeds will germinate and grow into crops. It is said that there is nothing, however difficult, that cannot become easy through familiarization. If you persevere in the practice of these instructions, you can be sure of achieving results. The meaning of leaving behind your native land is to leave behind the emotions of attachment, hatred, and the obscuring ignorance that permeates both. These three poisons, generally speaking, are most active in the relationships you establish with family and friends in your own homeland. There, it is all too easy for the protection of those to whom you are attached, and the increasing of their wealth and happiness, to become your main preoccupation... ou end up engaging in meaningless activities without end, frittering away what is left of your precious life... Not to see how pointless it would be to waste your life with such goals is simply ignorance. So, rather than stay near the people and things that are liable to arouse your attachment and resentment, go to a completely unknown place where there is nothing that will engender negative emotions. Your mind will not be disturbed, and you will be able to devote your time and energy to the practice of Dharma. As time goes on, it will become obvious through your practice of the Dharma that hatred toward anyone is a mistake. You will have nothing but good thoughts and intentions toward all beings. So, too, the pointlessness of becoming attached to anyone and anything will also become obvious, and you will see that all objects of attachment are like things perceived in dreams, like phantasmagoric illusions. Matthieu Ricard in Dilgo Khyentse Rinpoche’s Last Teaching, Tricycle Magazine (Fall 1997), a gathering unprecedented in Bhutan’s history. This page was last edited on 4 February 2019, at 18:47.